One of my bucket list items were checked off last week when we had the sunny weather that seems to have deserted us in recent days. I have always wanted to BBQ a whole chicken and since the purchase of the Jamie Oliver kettle BBQ I couldn’t wait to try it. There is a handy device that I purchased from B&Q for cooking chicken on a BBQ. It allows you to place a can of beer on a metal plate which is under some metal arms. 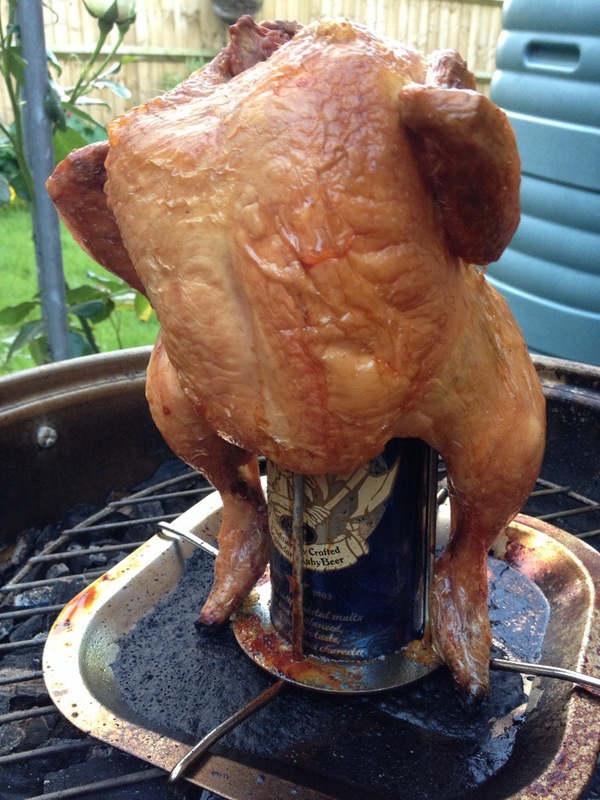 The chicken slides over the arms which allows the can of beer to sit inside the chicken. 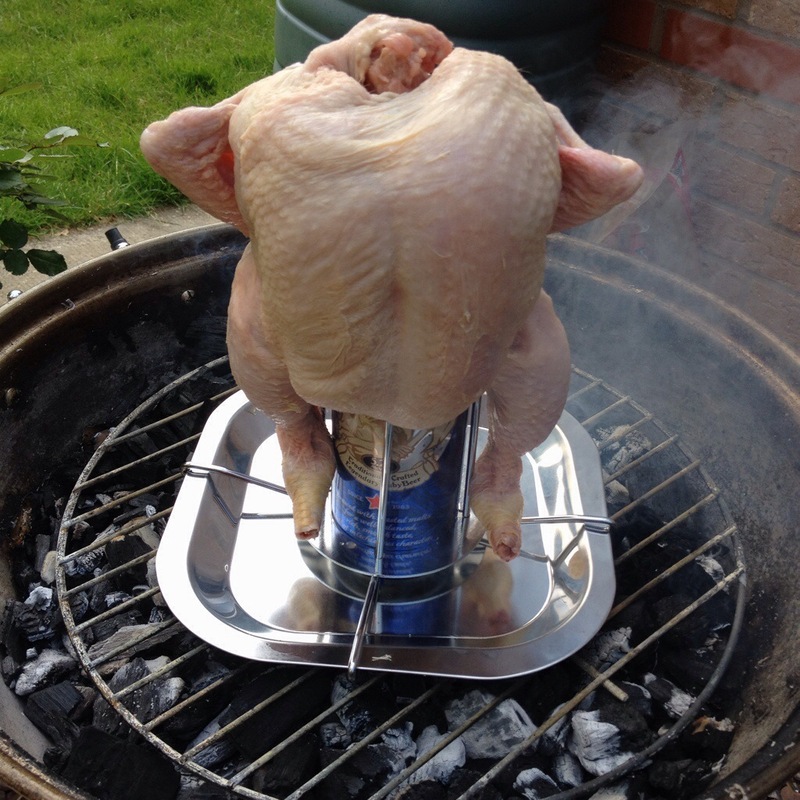 As the chicken is cooking on the BBQ the can of beer allows the chicken to maintain it’s moisture preventing a dry chicken. The beauty is it allows the chicken to crisp up nicely on the outside whilst giving the chicken an amazing flavour. I used a can of Hobgoblin which is a favourite Ruby Ale of mine. The medium sized chicken took just over 2 hours to BBQ cook and the smells coming from the Kettle BBQ were delightful. I used a couple of bags of self lighting charcoal to create a white hot base which heated up to a suitable temperature after 30 mins. The photos below show the stages explained above. The beauty cooking with the can of Ruby Ale is the chicken melted away from the bone when carving it. 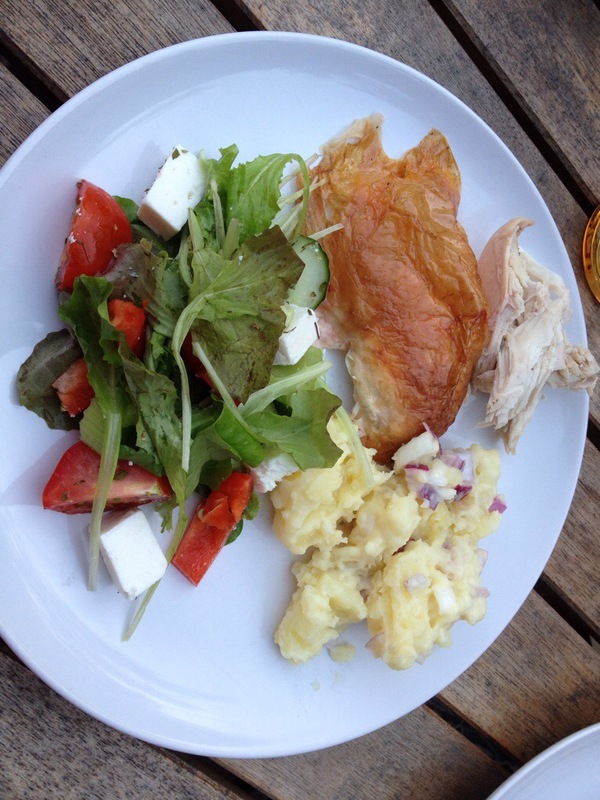 This is the best way to cook chicken and it is certainly something I’ll be doing again. 1. 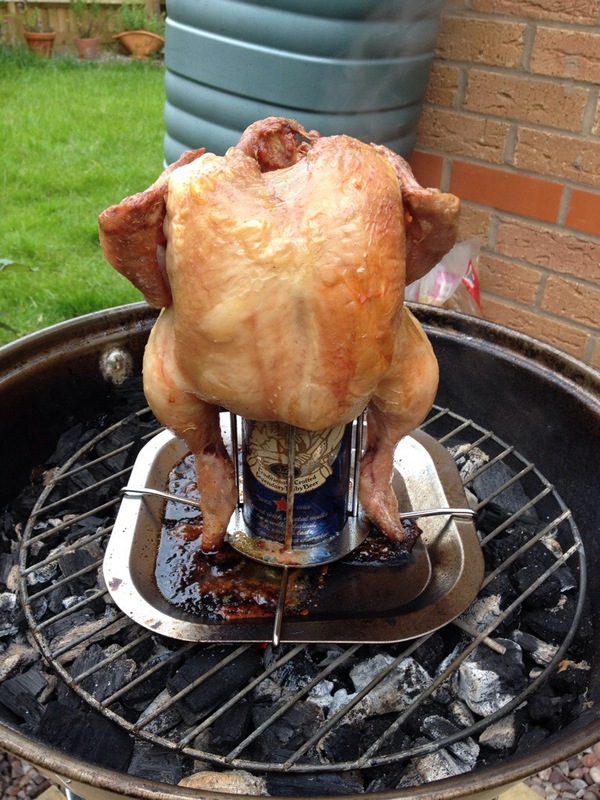 The chicken in place on device with Hobgoblin can sat under it. 2. The chicken after an hour on the Kettle BBQ, it’s starting to brown. 3. Just over two hours later and it’s ready to come off the BBQ. 4. Carved up and ready to eat. This is an amazing way to cook chicken and one that could be replicated when entertaining a group of friends. It’s certainly more cost effective than that of burgers and sausages. It has been a while since I’ve written about cooking, so what better opportunity than now. 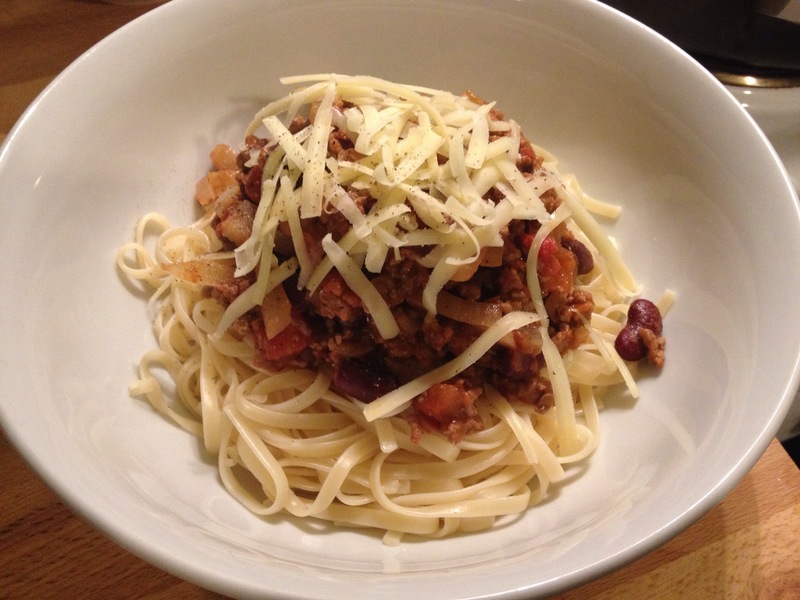 Tonight I tried out my home made version of the traditional dish Spaghetti Bolognese. Surprisingly this is the first time I’ve cooked this dish of mine in a very long time. I would be interested to hear back from anyone with their ways of making this. To start I heat up the Olive Oil in a large Sauce Pan and add the Mince Meat. Breaking up the Mince Meat in the pan so it cooks evenly, I will leave this to cook until it turns brown and the juices fully evaporate. This takes around ten minutes with the hob on setting 3. 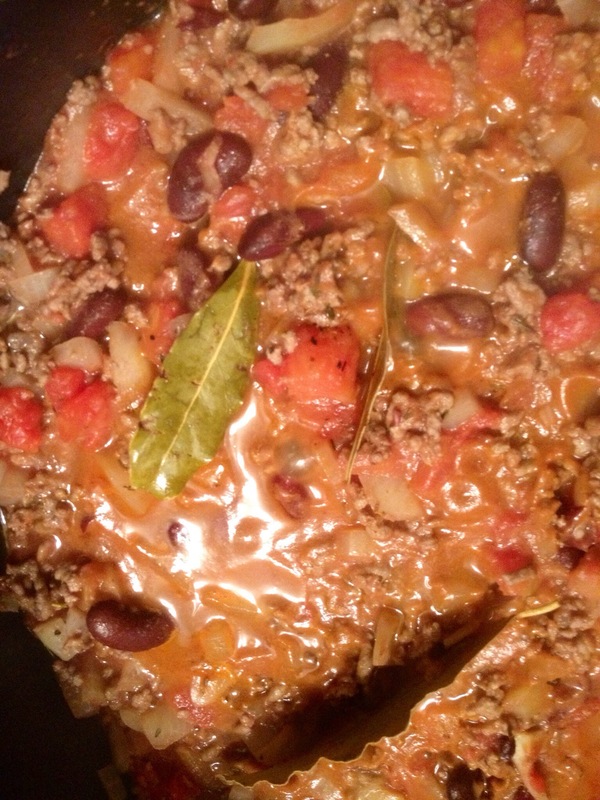 I then add the Red Wine to the Mince Meat and again leave this to simmer until the Red Wine is fully absorbed. At this point I add the chopped onions and allow the juices from the onions to soak into the Mince Meat, leaving the hob at Level 3. I will then add three squeezes of Tomato Purée to the Mince Meat and Onions and stir in. This is followed by the Tin of Chopped Tomatoes and I’ll bring the dish to the boil for five minutes. The saucepan is covered with the lid during this part. After 5 minutes I turn the hob back down to simmer on Level 3 and add 3-4 large dried Bay Leafs and 2 pinches of Dried Thyme. This is left to simmer for 15-20 minutes. The Bay Leafs are removed before serving because all of the flavour has left them. I will get the Spaghetti on and give it 10 minutes as the sauce is simmering. Pop the bowls in the oven to warm them up, drain the spaghetti and serve. I always grate some cheese and sprinkle it over the top and serve with The remaining Red Wine. Perfection! I hope you enjoy this and let me know how it works for you. 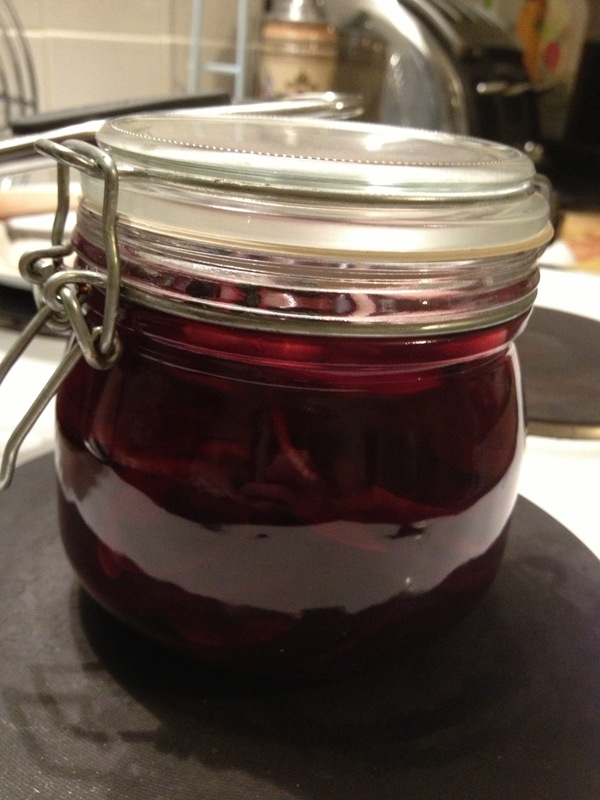 Tonight I decided to preserve the two mammoth Beetroot that I picked from the garden a couple of days ago. I’d love to claim ownership of this recipe, but I wouldn’t take that away from a certain Delia “Lets be Avin you” Smith. That was a football reference for my non football following followers, google it! The steps are easy and I’ve attached some of my photos from each stage. This little lot cost me £6.90 but then I grew the Beetroot so probably around £8 if you had to buy them. I also chose an Organic Red Wine Vinegar, it only seemed fair! You will also require a 1/2 liter glass jar to keep this in once completed. This must be sterilized before hand. I just wash it and put it in oven at no more than 130c to dry out. The rubber seal is washed by hand and placed in kitchen roll to dry. 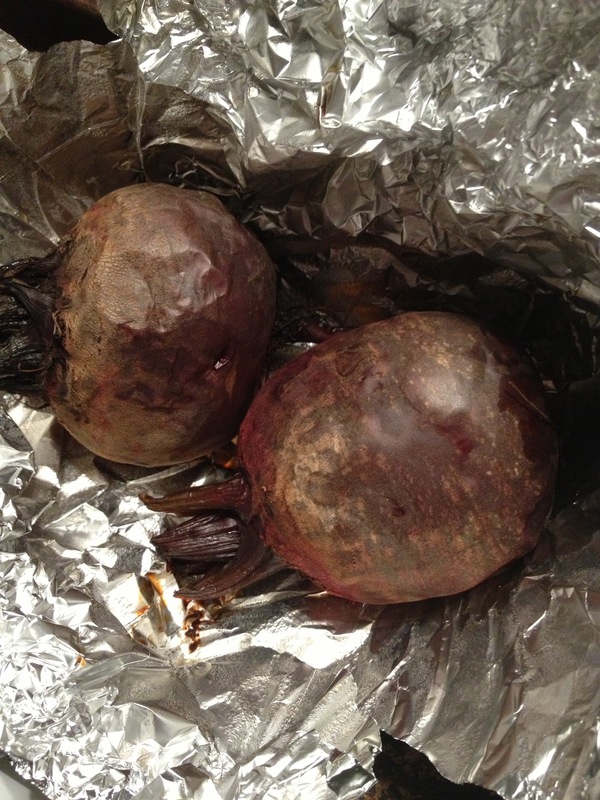 It was at this point I peeled the two shallots as this allowed for the Beetroot to cool down and chopped them finely. 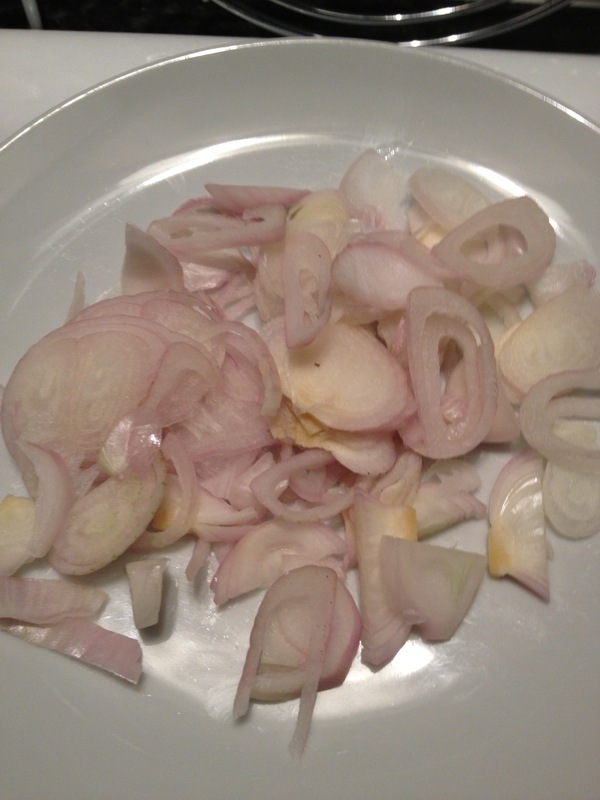 Once these were chopped, I started to prepare the vinegar. The vinegar sauce or dressing whatever you call it is simple to make. 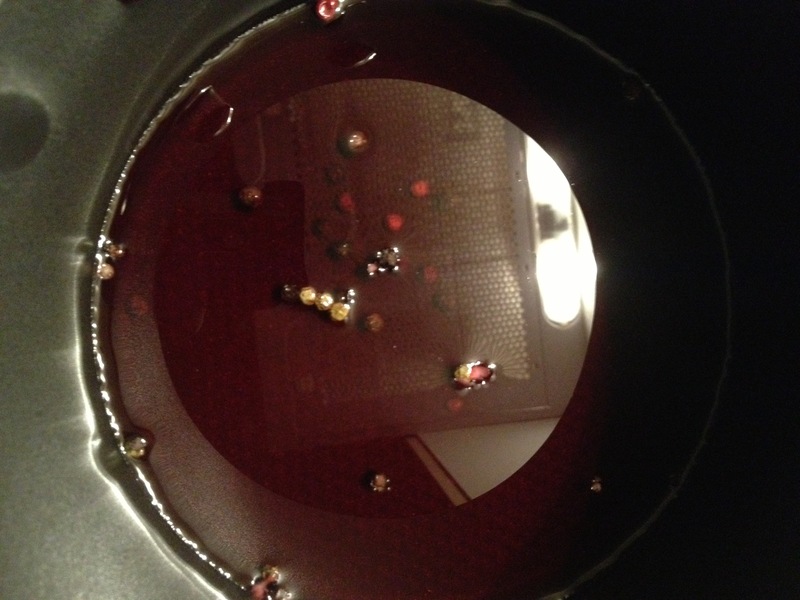 Take the 175ml of Red Wine Vinegar and add the 1/2 teaspoon of Pepper Corns and Sea Salt to it. Being to the point of simmering and then you can take it off the hob. This gives you a lovely mixture of colors and a very strong smell. 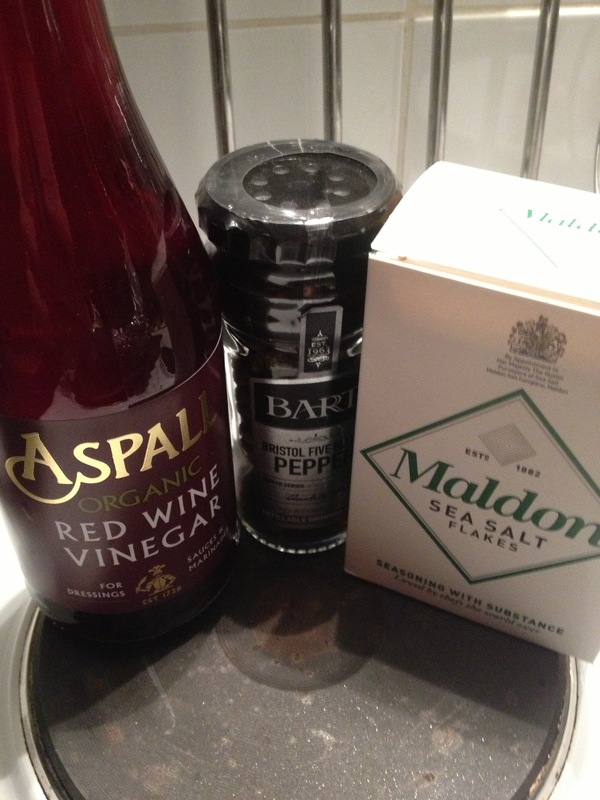 I ended up requiring 250ml of the Red Wine Vinegar so be prepared to pro rata extra Pepper and Salt to suit this. It was at this point I peeled the Beetroot that had cooled down and started chopping them finely. Now you need to take the sterilized jar and make sure it is still warm. If you don’t you risk a cracked jar. You need to layer the Beetroot and Shallots so they form nice compact layers. Once you have done this to just below the top of the jar, you are ready to add the Vinegar. I poured the Vinegar from the Pan back into the glass jug as it is easier to fill the Jar this way. In order to ensure the risk of cracking is removed, once the vinegar had reached simmering point, I sat the jar in cold water. This allowed it to be cooler. 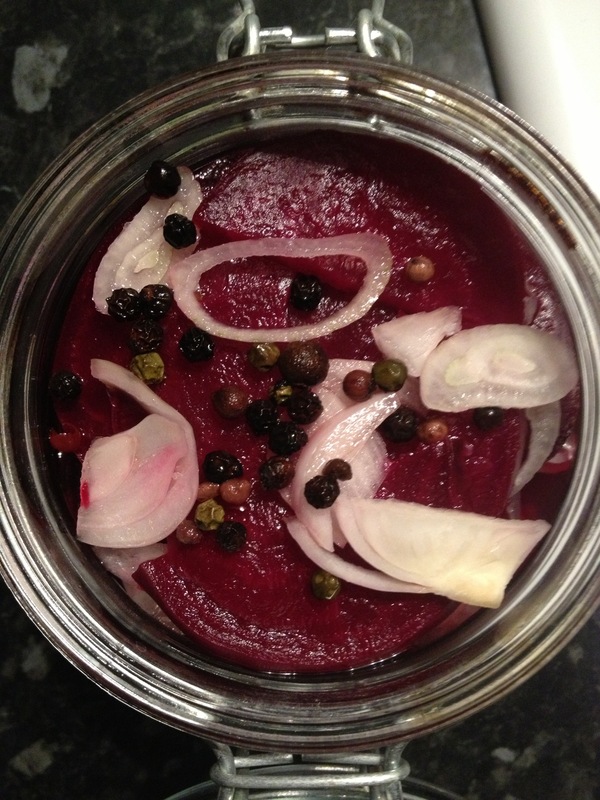 I then poured slowly the Vinegar with Pepper Corns shimmering into the jar, ensuring the top layer is covered. Once this was completed, I shut the jar tight and clanked the lid down. According to Delia this will be edible in 2 days. It can last up to 2 years, I think I will be nibbling on this sooner. Please note the Shallots are added raw and not cooked. Only time will tell how good these taste, but I’m going to give the ease of this recipe an 8/10. The only down side is the 3 hours waiting for the Beetroot.